Give your phone a makeover and design Galaxy S7 Edge custom phone cases. Your unique designs are printed onto hardwearing, glossy plastic using a process that guarantees the colours won't scratch or peel off. Scratch resistant and shatterproof, the custom Samsung S7 Edge case is the trendy way to protect your phone. Let's be honest, our phones are practically glued to us, so it makes sense to decorate them to reflect our style and personality. Well, say hello to custom phone cases. Galaxy S7 Edge from Samsung is a slick smartphone that deserves a good looking coat, so design your very own Samsung S7 Edge case personalised with your photos or designs. My son is platypus obsessed, so to find somewhere that I could design a phone case with a platypus on was the perfect gift! The case arrived within a couple of days of ordering and the image print quality was fantastic. It hasn't been used yet so cannot comment on durability but it looks like it will be pretty scratch resistant. All round very satisfied customer! Great product - looks exactly right. Excellent - as always. Thank you. Phone case was a hit with my friend! The printing process we use binds the ink to the plastic cover, creating a long-lasting, vibrant print overall. Your photos or design wrap around the curved edges, creating a 3D effect. Everything is done to order in London, UK, by our expert printing technicians. There are cutouts to facilitate the camera and volume buttons, so when selecting your image and editing the design, please bear in mind the positioning of the camera. This can be seen in the product preview in the online design tool. If you're printing a portrait, make sure you don't position their face where the camera is as it'll be cut out from the final design. 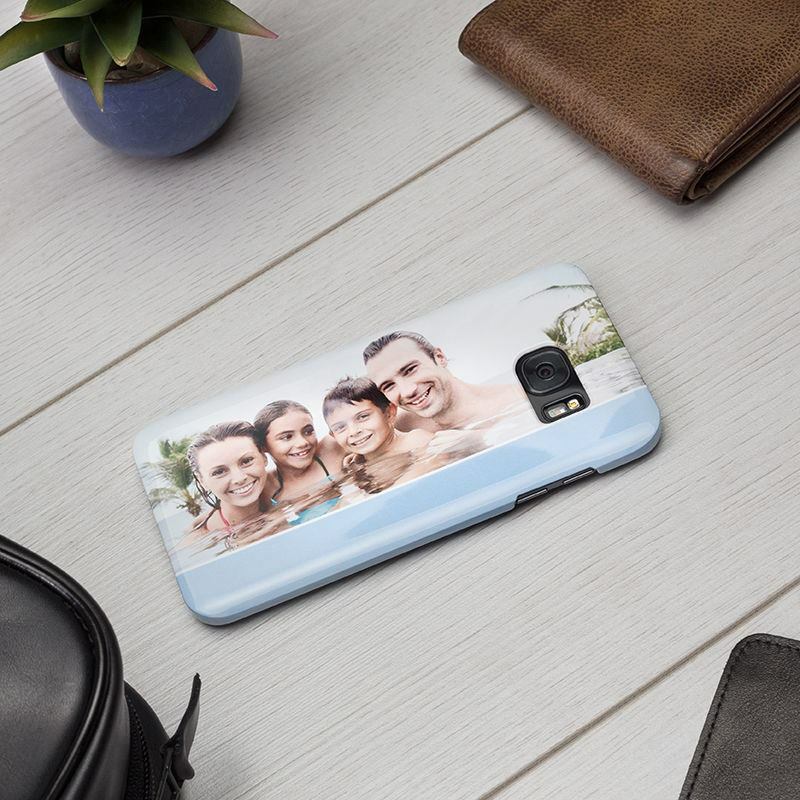 Note: The image print wraps around the sides, making these custom Samsung Galaxy S7 Edge phone cases ideal for patterns or pictures with a centred subject. Create a personalised cover as a special gift for a loved one. Boys who love sports or action movies will love a case that has their name next to a photo of their idol. For example 'Dan 'The Man's Phone' or 'Johnny Boy's Phone'. Think of something witty and have fun designing it. For pet lovers, this is the perfect way to improve on the already existing animal themed cases in the shops. Why have a random dog or cat when you can put a photo of your own beloved fur child onto a custom phone cover? Each time you get your phone out, their sweet face will be looking back at you adoringly. Graphic designs with bold colours and patterns make for a striking personalised Samsung S7 Edge case. There are loads of themes such as sci-fi, nature, romance, astrology...the list goes on. Create your own artwork or find a stunning image that perfectly reflects your individuality.